SANYO is pleased announce that the travel distance of 555.6 km (345 miles)by a Mira EV powered by SANYO lithium-ion battery systems has been officially recognized as the longest journey by electric vehicle without recharging by the Guinness World Records. 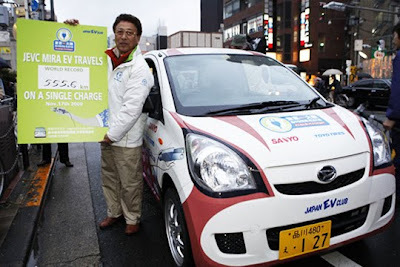 This trial run was provided by Japan Electric Vehicle Club (Japan EV Club) and implemented by driving the Mira EV from Tokyo to Osaka, Japan on November 17, 2009. The SANYO lithium-ion battery systems housed in the Mira EV were designed by assembling 8320 cylindrical lithium-ion batteries (18650-type) which are normally used in laptops etc. Total pack capacity is 74 kWh and with battery management limitations taken into consideration approx 50 kWH of that was used on the trip. The unofficial World Record is still held by a Solectria Sunrise which covered 604 km (375 miles) on a single charge, during the 1996 American Tour de Sol. I'm only impressed if they travelled at a decent speed. Loads of these type of records seem to be set with a vehicle doing a speed so low that it just isn't in anyway representative of the real world.